HONOLULU — A new tool for people who are deaf, hard-of-hearing, or deaf-blind is now available statewide. 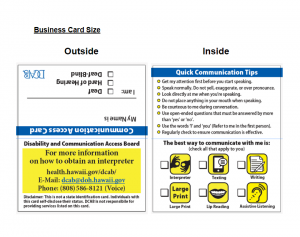 Developed by the Hawai‘i State Disability and Communication Access Board (DCAB), the new Communication Access Card is a quick, convenient, and comfortable way for individuals with communication access needs to self-advocate for their preferred communication method. The card is a valuable tool at work, while traveling, at events, for emergency preparedness, and in everyday situations where individuals with communication access needs face barriers and difficulties due to others not understanding that they require alternate methods to communicate effectively. The card can be individually customized by the user to show his/her name, identity as deaf, hard-of-hearing, or deaf-blind, and preferred communication method(s). Methods include sign language interpreting, writing, texting, lipreading, large print, and/or using an assistive listening device. The card also includes quick tips for people who want to improve their communication with the individual bearing the card. 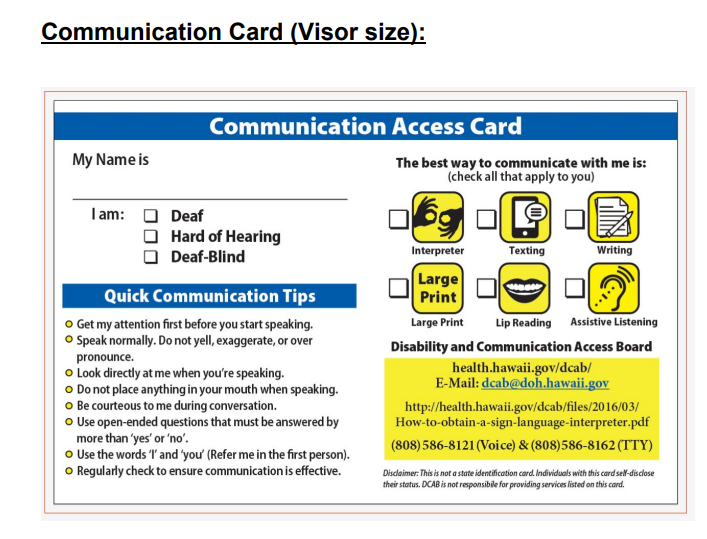 Communication Access Cards are available at no cost in two sizes. One is a standard business card size (3.5 by 2 inches when folded) which easily fits in a wallet or phone pocket. The other is a larger visor-sized card (8.5 by 5.5 inches) to keep in a vehicle’s visor or glove compartment to prepare for emergencies. DCAB emphasizes that the Communication Access Card cannot be used as an official state identification card. Communication Access Cards are not numbered and no agency will keep a record of individuals in possession of the card. Individuals with this card may use it to self-disclose their status. DCAB is not responsible for providing services listed on the card. DOH District Health Offices on Kauai, Hawaii, and Maui will also have the cards available for pick up free of charge. The cards are also free for pick up at various locations statewide, including the Comprehensive Service Center for People who are Deaf, Hard of Hearing, or Deaf-Blind and Vocational Rehabilitation offices. A complete list of locations can be found at health.hawaii.gov/dcab/communication-access/. 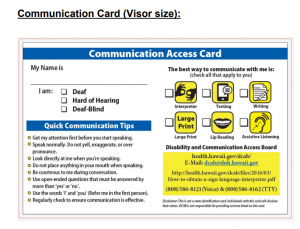 What do the Communication Access Cards look like? 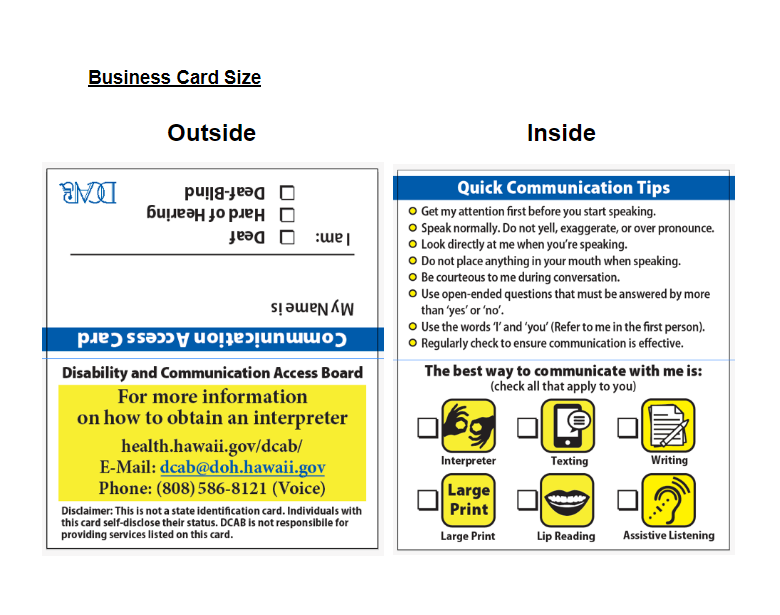 More information about the Communication Access Card can be found on DCAB’s website at health.hawaii.gov/dcab/communication-access/. All inquiries can be made by contacting DCAB via email at communicationaccess@doh.hawaii.gov or by phone at (808) 586-8121 (Voice) or (808) 829-3641 (Video Phone).